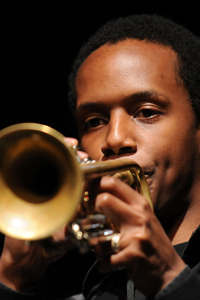 Jason Palmer is a trumpeter, composer and educator. He’s also an actor (more about that later). Once described as fast-rising, it’s fair to say Jason has now risen, and to pretty lofty heights—now one of the most in-demand musicians of his generation. Having come to Boston originally to study at Berklee College of Music, he has put down roots in the city and is now a member of the faculty at his alma mater. Jason’s quintet has been the house band every weekend at Boston’s historic Wally’s Jazz Café for the past twelve years. He has presented his band at the Tanglewood Jazz Fest, Sculler’s Jazz Club, the Stone and the Jazz Gallery in New York City, the Studio in Hartford, Connecticut, and other New England venues. Seacoast jazz fans have enjoyed his frequent performances at The Press Room in Portsmouth. In 2007, Jason was commissioned by the Festival of New Trumpet Music in New York City to premier a new work—one he based on a Sudoku game—for his quintet at the Jazz Standard. The music from that suite is featured on Jason’s 2016 record on SteepleChase, Beauty’n’Numbers: The Sudoku Suite. Always in good company, Jason has performed with a veritable Who’s-Who of jazz luminaries, among them Roy Haynes, Herbie Hancock, Jimmy Smith (the organist), Wynton Marsalis and the Lincoln Center Jazz Orchestra, Kurt Rosenwinkel (first trumpeter to ever be hired by this highly acclaimed guitarist), Ravi Coltrane, Mark Turner, Jeff Ballard, Lee Konitz, Phil Woods, Common, Roy Hargrove, and Lewis Nash. Among his honors, he was a recipient of the 2014 French American Cultural Exchange Jazz Fellowship and was named a 2011 Fellow in Music Composition by the Massachusetts Cultural Council. He took First Place in the 2009 Carmine Caruso International Jazz Trumpet Solo Competition, and in June, 2007, DownBeat Magazine named Jason Palmer one of the “Top 25 Trumpeters of the Future.” In addition to performing on over 40 albums as a sideman, Jason has recorded eight albums as leader and is currently a Steeplechase Records Recording artist, three of his recordings having received four stars or better in DownBeat Magazine. He has toured over 30 countries with saxophonists Greg Osby, Grace Kelly and Matana Roberts and has been a featured guest artist on multiple projects. In addition to serving as an Assistant Professor of Ensembles and Brass at Berklee, Jason is a visiting Assistant Professor at Harvard University and has served on the faculty at the New School of Jazz and Contemporary Music, among other educational assignments. He has given master classes in Portugal, France, the UK, Russia, and Mexico. Oh, and about Jason Palmer the actor: He was the lead actor in Whiplash director Damien Chazelle’s Guy and Madeline on a Park Bench. The movie received great reviews after premiering at the Tribeca Film Festival in 2009 and has since screened at film festivals in Greece, Denmark, Austria, Australia, Bratislava, Martha’s Vineyard, Houston, Denver, Seattle, Los Angeles, Calgary, Minneapolis, and Mill Valley, California. So besides being able to hear Jason perform at the 2017 Tommy Gallant Jazz Festival, you may also get to see him on the silver screen.